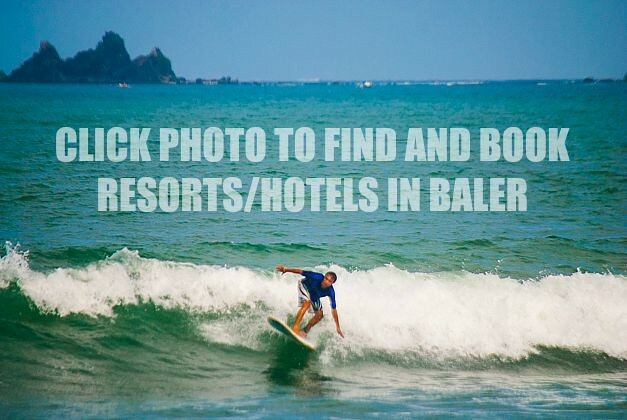 Baler has flourished as one of the top surfing spots in the Philippines. Blissfully tucked in the province of Aurora, this once sleepy municipality is now a popular tourist destination dappled with resorts, cafes and surf shops that have never stopped expanding. 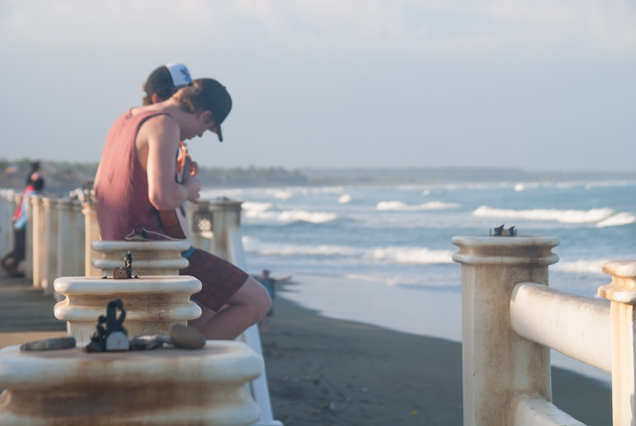 But Baler is not all about the endless surf of Sabang Beach, you haven’t really fully experienced this bucolic town if you haven’t gone on a day tour. Explore Baler and discover its unspoiled waterfalls, ruggedly enchanting azure beaches, gorgeous cliffs that drop straight into ceaseless waves and age-old historic edifices. Baler in Aurora province overflows with utterly beguiling beaches. Marcos here enjoying the view. Genesis has air-conditioned daily buses en route to Baler from their Cubao Bus Terminal. Daily trips run from 3:00 AM to 7:30 AM (5-6 trips daily, 1 hour interval). Travel time 6-7 hours, bus fare is around Php 550. For those who want to splurge, reserve ahead for an executive luxury trip via Joy Bus (also owned by Genesis). Their non-stop service trip provides passengers with pillows, blankets and snacks and a bus stewardess to assist you with your needs. Fare is Php 750, travel time is 5 hours. Joy Bus can get too cold, so wear a thick jacket. If your schedule won’t permit you to ride the Genesis or Joy Bus, you can go to Baler from Cubao via Cabanatuan. So from Manila, you can ride a Victory Liner or Baliwag Transit bus to Cabanatuan, then transfer to a bus or passenger van to Baler. Bus fare from Manila to Cabanatuan is around Php 185 and travel time is 3-4 hours. Then from Cabanatuan, take a van (available 24/7) bound for Baler for PHP 220. Lizardo Bus has daily trips to Baler from Baguio – Slaughterhouse Terminal at 2:00 PM. Bus is ordinary, fare is Php 330, and travel time is roughly 9 hours. The bus passes by outside the welcome arch of the town of Pugo, La Union. We took this route to Baler as we were already in Baguio. Despite being a famed surfing spot, Baler still evokes a laid-back vibe. From Baler, Genesis runs to Pasay daily from 4:30 AM to 3:00 PM (1 hour interval). Take note the Genesis Bus Station is situated a stone’s throw away from baler Bus Terminal. If you miss their last trip, you can ride a passenger van or Aurora Bus to Cabanatuan, Nueva Ecija and from their, board a bus (Five Star or Victory Liner) bound for Manila. From Baler to Cabanatuan, fare is Php 185 and from Cabanatuan to Manila (Cubao or Pasay), fare is Php 185. 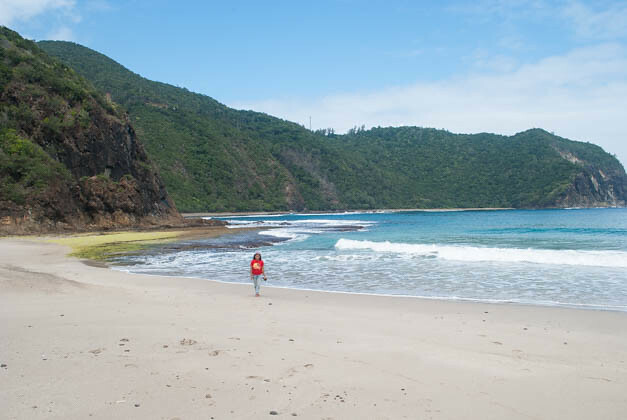 From your hotel or resort in Baler, you can ride a tricycle to Sabang Beach for about Php 10-Php 20 per person. The usual way to tour around Baler and Aurora is by hiring a tricycle or habal-habal. Tricycle Tour costs Php 800 for a whole day tour, good for 3 people. Half day tricycle tour costs Php 500. Recommended tricycle driver: JR Cionelo , contact # 0910 820 8506. I will write another detailed post about Baler tourist attractions, but for the meantime, here’s my handpicked hot-list of things to do while in Baler town. Ride the waves of Sabang Beach. 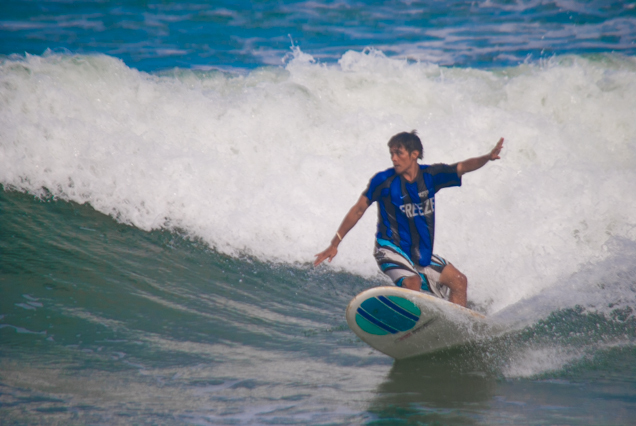 When in Baler, go surfing in Sabang Beach! Surfing lesson costs: Php 350 per hour with personal surfing instructor. Board rental is Php 200 per hour. You can contact Eric Soriano at 0923 8828 930, a local surfing instructor. Swim at Ditumabo Falls or Mother Falls and see Diguisit Falls. 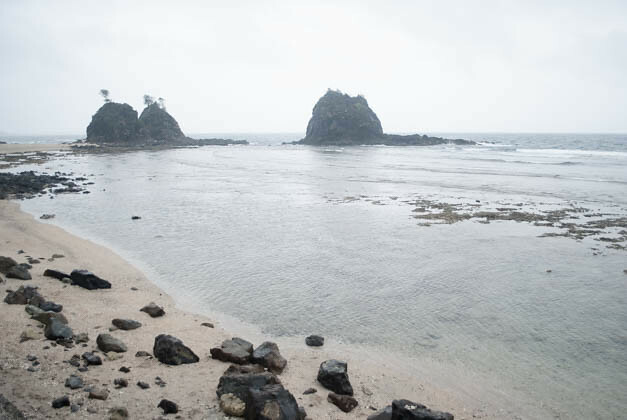 When in Baler, visit Lukso-lusko islets in Diguisit. Don’t leave without having your #selfie taken inside this colossal age-old Balete tree. 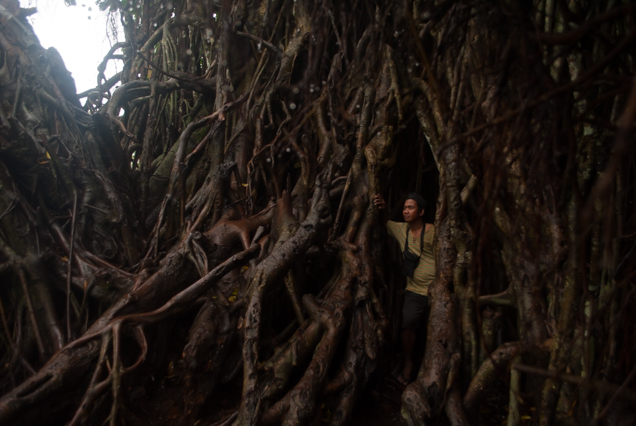 Visit the age-old, gignatic Balete tree. The accredited tour guides of the Balete tree take your photos and video using your smart phones and be surprised at how they do the camera tricks. Your tips to these Balete tree guides will be highly appreciated. Climb Ermita Hill which offers a scenic view of the surrounding bay and cross the Baler hanging bridge. Relive history by visiting the historic Baler Church, the intricately designed Baler Museum and Aurora Quezon House. Entrance fee is only Php 35, good for the two sites already. The province of Aurora (where Baler is located), is named after the wife of former president Manuel Quezon, reason why you’ll also see his statue and portraits around the province. The postcard-worthy Ampere Beach in Dipaculao town beckons photographers. When traveling to Baler. Catch the sunrise at Ampere Beach in the nearby town of Dipaculao, Aurora. 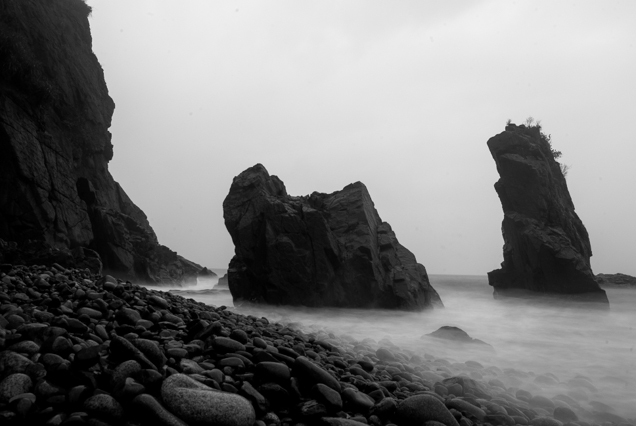 This beach is popular because of the rock formations and stones scattered on its shore. You can hire a tricycle for Php 500, two-way and good for 3 people, contact JR Cionelo at 0910 820 8506. ⊗ The Rolling Store – Try the sinigang at Poblete Store and barbecue and grilled tilapia at the Ihaw-ihaw store. By far our most affordable and sulit eats in Baler. They serve home-cooked meals. ⊗ Yolly’s Ihaw-Ihaw – We (Marcos and I) highly recommend their grilled white marlin and timpladong sukang Baler! ⊗ Bayler’s Inn – We love their pasta – order either Carbonara or Longganisa pasta. ⊗ Bay’s Inn – We dig their fries, but not their burgers. They are known for their chicken though, so try to order that when you pay them a visit. ⊗ Carlito’s Eat All You Can – I like their macaroni salad. Nothing special about their meals, but we find it a little better than Gerry Shan’s. ⊗ Gerry Shan’s – Eat-all-You-Can for Php 199 with bottomless iced tea. Nothing special about their food, we honestly find it too salty. 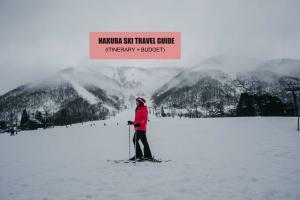 But you can give it a shot as it is featured and recommended by famed Travel Shows and other travel blogs. There are plenty of cheap and mid-range Baler accommodations like transient house, guesthouse and hostel. I recommend booking online as many hotels and resorts gets fully-booked on weekdays and holidays. The list below have good reviews online but I’ve yet to try them. 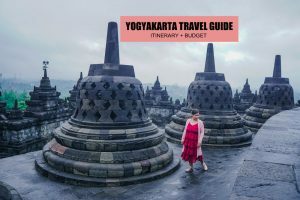 ⊗ This sample budget is good for a solo traveler. You can lower it down if you save on food or find a cheaper accommodation. Best to share the trip with friends so you can lower the tricycle expenses. ⊗ Tricycle Tour for whole day costs Php 800, good for 3 people. Half day tricycle tour is Php 500. Here’s a sample Baler Itinerary for 2 days one night. Hi! How much did your baler tour cost? Hello, kahit ba walang kotse makakapunta po sa lahat ng tourist spot na sinabi mo po? 🙂 kaya ba ng commute lang? Hi Kenn, I lost his number. I’m sorry. 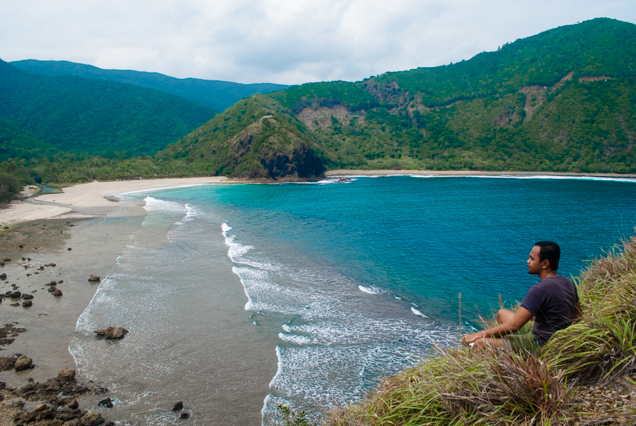 When is the best month to visit baler? is april/may ok? Hi, do you have contact details of the bus companies (especially Lizardo lines)? I was wondering if they have a Baguio-Sagada trip on the 25th of March (that’s a good friday). Thanks. No po. I’m sorry. But they do travel everyday naman regardless if it’s a holiday, so I think yes. Solo lang ako. Meron kba contact for tour only na ksama na lahat. Mag commute lang me at hanap ng own hotel. Yes, kindly contact Tita Virgie, number is listed below (Casa de Viajeros). Hi! We are planning to go to Baler with private car, how’s the road condition? Thanks! If I remember it correctly, paved road naman ang highway at town center. Thanks. They contacted me and offered the tour and hotel stay. Hi. We are going to Baler next weekend. Do you have any suggestion where to stay there? Thanks. Hi! Do you have any quoted amount of how much for solo tour or joiner tour offered by Baler Case de Viajeros or how to there from Bus Terminal? hi do you have contact numbers ng tour guides? Hi. Where can we find the tricycles who offer day tours? In Baler town. Just hail one. Hi safe po ba kahit naka-private car papuntang dicasalarin cove?